The Betty apron features fun, feminine prints with chic detailing. This vintage-inspired apron is constructed in a lightweight cotton fabric and finished with pretty pleats and eye-popping accents. 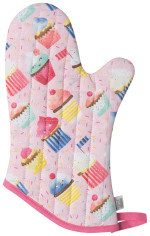 Be inspired to cook and bake delicious meals with this bright and cheerful print!